A Festival Full of Fun! For more than 50 years, the Come-See-Me Festival has served as Rock Hill’s annual salute to spring. 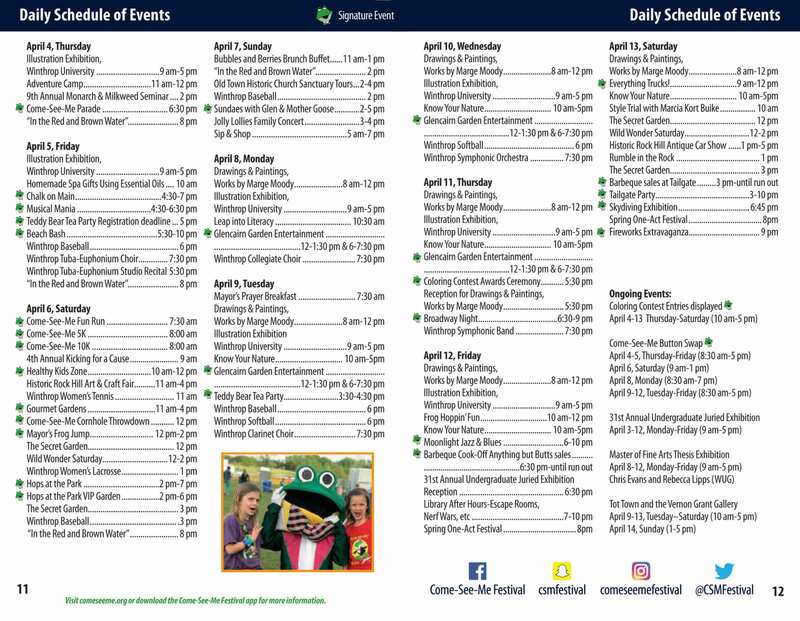 With nearly 80 events and activities, there’s something for everyone. Join us April 16 – April 25, 2020 and experience our beautiful gardens, friendly folks, and all the fun the festival has to offer. The unveiling of each year’s custom-designed logo is always one of the most highly anticipated events in Rock Hill. The 2019 festival logo gives a nostalgic nod to the design used in 1985. That year’s chair, former Rock Hill mayor Doug Echols, is the father of the 2019 Festival Chair, Chad Echols. Chad used his father’s version of the logo to create a design that’s both nostalgic and unique. The background for Glen the Frog was obtained from Vernon Grant’s 1964 logo. You might have seen 2019’s logo on many festival promotions around the city. It’s a sure sign of spring in Rock Hill and of all the fun of the Come-See-Me Festival. Join us for all the excitement next April!